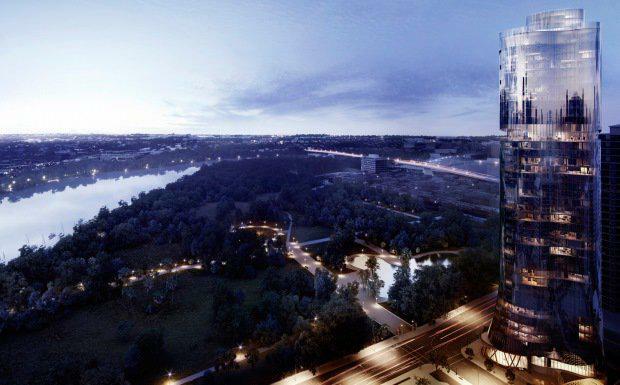 Luxury residential developer Sunland Group has announced it will commence construction on its luxury Abian residential tower in Brisbane next month following strong pre-sales totalling $160 million. The striking Wood-Marsh-designed 40 level tower, located at the entrance to the Botanic Gardens in the Brisbane CBD, comprises 147 luxury two, three and four-bedroom apartments, villas and penthouses, with prices now starting from $1.38 million. Sunland Managing Director, Sahba Abedian, said the overwhelming sales success at Abian, which is now 80 per cent pre-sold, has enabled the Group to fast-track the project’s construction program. “Abian is redefining the luxury residential market in Brisbane and is unmatched in terms of its location, architectural design and amenity,” Mr Abedian said. “The strong level of buyer demand indicates a healthy appetite in the market for design-driven, luxury product, with 116 of the 147 residences now under contract. Mr Abedian said the project would be delivered by the Group’s in-house construction division, Sunland Construction, with completion scheduled in mid-2017. He said Brisbane was a key focus of Sunland’s growth strategy, where the Group is also planning to deliver a new multi-tower residential project on the Brisbane River in Toowong. Priced between $1.38 million and $3.3 million, each superbly appointed residence at Abian features modern, luxury interiors complete with floor-to-ceiling windows, travertine floors, Italian tap wear, Miele appliances and freestanding baths. Premium resident facilities including a concierge, swimming pool, spa, gym, sauna and steam room, and treatment rooms, and each residence is also allocated car parking and storage bays. The final release of the prestigious Garden apartment collection offers a premium mix of three and four bedroom residences, perfected by unrivalled views of the Botanic Gardens, Brisbane River and beyond. A unique feature of the Garden apartments is their generous floor areas, ranging in size from 161 square metres to 324 square metres, reflecting buyer demand for larger living spaces. Sunland have been responsible for delivering some of Australia's most iconic buildings, including Palazzo Versace and Q1 on the Gold Coast.